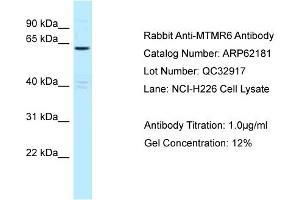 Characteristics This is a rabbit polyclonal antibody against MTMR6. It was validated on Western Blot. Background MTMR6 phosphatase that acts on lipids with a phosphoinositol headgroup. It acts as a negative regulator of KCNN4/KCa3.1 channel activity in CD4+ T-cells possibly by decreasing intracellular levels of phosphatidylinositol-3 phosphatase. It negatively regulates proliferation of reactivated CD4+ T-cells.